Jason Van Dyke was released after posting $150,000 bond Monday evening. He is charged with first degree murder in the shooting death of Laquan McDonald. CHICAGO (WLS) -- After viewing the police dash cam video tape privately and in open court, a judge set bail at $1.5 million for Jason Van Dyke, the Chicago police officer charged with first-degree murder in the shooting death of Laquan McDonald, 17. Van Dyke posted bond and was released from jail shortly after 5 p.m. Monday. Van Dyke's family posted the $150,000 bond, 10 percent of the bail amount. He was met at Cook County Jail by his father. He said nothing as he walked out of the jail to his car, despite a significant media presence. He is due back in court for a status hearing on Dec. 18. In court, Van Dyke wore a brown Cook County Jail jumpsuit, his hands and feet shackled as he was surrounded by several sheriff's deputies. There was no expression on his face when his no bond status was lifted. "He is prepared to defend himself," said Dan Herbert, Van Dyke's attorney. "He is very scared about the consequences that he's facing, he's concerned for his wife and his children, but he is handling it like a professional and he is ready to move on and take this step by step." Van Dyke has been in jail since last week, when he was charged with first-degree murder after shooting McDonald 16 times in October 2014. He is the first Chicago police officer in decades to be charged with first-degree murder. There is no disagreement that Van Dyke, 37, fired the shots seen on the dash cam video. At issue is whether he feared for his life. His supporters and especially his union, the Fraternal Order of Police, say there is more to this case than the videotape. "Prior to the engagement of the first shots fired, the shoulders square off to the officer with knife in his right hand," said Dean Angelo, President of the Fraternal Order of Police. I will not be bullied by politicians who do not have a full understanding of the facts of this investigation. I offer no apologies for enlisting the FBI to investigate Laquan's murder because obviously the Chicago Police Department could not investigate themselves in this case. And I certainly do not apologize for conducting a meticulous and thorough investigation to build the strongest possible First Degree Murder case against Officer Van Dyke. Angelo said that he is concerned not only for Van Dyke's safety but for the safety of all uniformed police officers in the city. 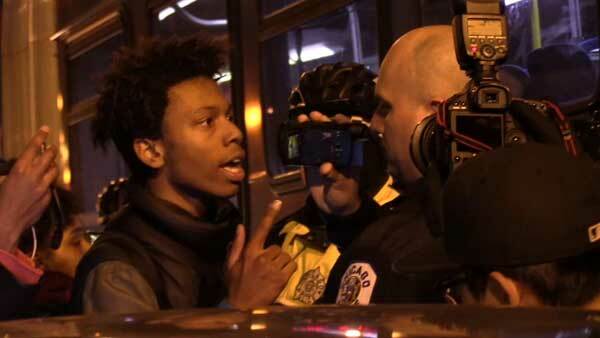 He is furious that charges were dismissed for a protester who allegedly hit a police officer during the demonstrations immediately following the release of the dash cam video. "Someone walks out of felony bond court that punches a police officer because of a phone call that is made, or because someone felt it was the right thing to do for community peace," Angelo said. "But that is unprecedented." A prayer vigil was held outside Chicago Police Headquarters at 35th and Michigan on Monday night. Some 200 protesters led by a group of ministers framed the handling of the McDonald case in moral terms. "They didn't release the video for 400 days, and they have a moral obligation to do that," said Shawn Casselberry, a protester. "McCarthy needs to be fired. And as a taxpayer, this building needs to be closed," protester Jedidiah Brown said as he attempted to chain the doors of the front entrance of police headquarters. Within moments, officers rushed in and preventing him from doing so. Fellow protesters were at his side during a tense face-to-face standoff with police. Brown eventually walked away and was not arrested. Protests have been ongoing since the release of the video and announcement of charges for Van Dyke on Tuesday, Nov. 24, and demonstrators were present at the courthouse. Protesters marched around City Hall Monday afternoon holding signs and pushing coffins while changing "16 shots!" Monday afternoon. NAACP leaders joined local clergy and others to call for police reform in Chicago. After speaking with media, protesters linked arms and knelt in the street while singing "We Shall Overcome," blocking traffic. Chicago police arrested at least 8 of those protesters peacefully. Protestors marched on Michigan Avenue on Black Friday, which is one of the busiest shopping days of the year. Organizers said they plan to protest 16 days, one for each time the teenager was shot. Protestors call the delay in charges against Van Dyke a police cover-up. Some are calling for the resignation of Chicago Police Supt. Garry McCarthy; others want Chicago Mayor Rahm Emanuel to step down. Both the Chicago Police Department and Mayor's Office have denied any wrongdoing. As criticism of the city's handling of the McDonald case mounts, Mayor Rahm Emanuel's office announced late Monday the formation of a task force on police accountability, which will review the current system of oversight and training here at CPD. Mayor Emanuel will announce details on Tuesday.